A painter from Antwerp, Joos van Clève, also known as Joost or van der Beke, was best known as the “Master of the Death of Mary.” This was a name bestowed to him for his famous painting, The Death of the Virgin, housed in the Alte Pinakothek of Munich. His surname comes from his birthplace of Cleves (Today, Kleve), which is a city in the lower Rhine of Germany, near the Netherlands border. His father, William van Clevè the Elder, was also documented as a painter in the Antwerp Academy or painters’ guild. Joos van Clève would later serve as dean of the guild between 1515 and 1525. 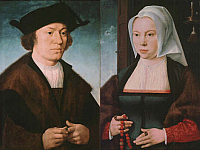 He had a number of important patrons he painted portraits for, including King Francis I (1494 – 1547) and his wife Queen Eleanor of Habsburg (1498 – 1558). This artist’s 1530 portrait of Eleanor is a well known, standard depiction of her. He also painted a portrait for King Henry VIII of England (1491 – 1547). Additional to his travels for these royal commissions he may have also traveled to Italy, being influenced by Leonardo da Vinci (1452 – 1519). He was also greatly influenced by the Flemish artist of the Antwerp School, Quentin Massys (1465 – 1530). 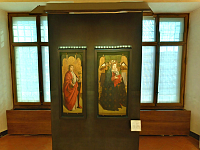 His diptych work now in the Uffizi Gallery, an unknown Portrait of a Man and Woman, was once though to be a Self-Portrait of Massys and his wife, but is now accredited to Clève, (Kren and Marx, Web Gallery of Art). The artist is mentioned to have collaborated with the influential Flemish painter, Joachim Patinir (1480 – 1524). Patnir was an accomplished landscape artist and a well know collaboration with Clève was on the piece, Rest on the Flight to Egypt. Clève also had a son, Cornelis van Clevè (1520 – 1570), and he collaborated with his father, developing his own Italian influenced style. According to the biographer Karel van Mander (1548 – 1608), in The Book of Painters from 1604, Cornelis’ failed attempts at establishing himself as a portraitist drove him into insanity, acquiring the name Sotte (Mad) Clevè. Joos van Clève painted several other depictions of the Virgin Child additional to his masterpiece, along with other religious subjects and a number of portraits.